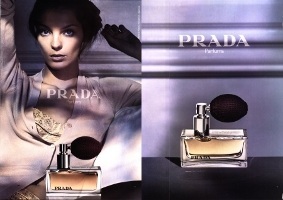 Prada released Prada Eau de Parfum, their first mainstream perfume offering, in 2004. It was developed by Carlos Benaim, Max Gavarry and Clement Gavarry, and the notes include bergamot, orange, bitter orange, mandarin flower, mimosa, rose absolute, schinus molle, peru balsam, patchouli, raspberry flower, labdanum, tonka bean, vanilla, musk and sandalwood. Prada won a Fifi award for the fragrance in 2005. Prada Eau de Parfum is all about amber; other notes come and go, but the amber is prominent from the first spray. Citrus decorates the top notes, a whisper of florals the middle, and a dry, earthy patchouli with vanilla accents the base, but the amber is the star here. It is, as advertised, a modern sort of amber; it is warm but not rich or heavy, and smells nothing like its hard-hitting oriental forebears. I call it modern, but others do not: a quick perusal of the reviews at MakeupAlley reveals a surprising number of "old lady fragrance" complaints about Prada Eau de Parfum, and it is true that Prada did not bow to the current convention which says that if you want to attract the massive youth market, you have to include lots of sugared fruit. Comparisons also abound, mostly to Thierry Mugler Angel and Chanel Coco Mademoiselle, but Prada is a considerably more restrained fragrance than either. Whether that is a good or bad thing, of course, depends on your preferences. As I don't adore amber, it strikes me as a good thing. Amber lovers, do comment! Prada Eau de Parfum Intense followed in 2005. The notes given are identical, but Prada Intense is not merely a more concentrated version of the original scent. The patchouli is considerably more in evidence, giving the Intense an earthier edge, and it is marginally sweeter and warmer. It also smells fruitier to me — there is something almost plummy about the mid notes — and it is longer lasting, although it still isn't quite a powerhouse in terms of longevity. The relationship to Angel is more marked in the Intense, but to my nose they are still distant cousins at best. The Intense retains a feeling of restraint, and while it is sweeter and fruitier than the original, it is still a relatively dry fragrance. Surprisingly, given that I don't like patchouli much more than I like amber, I prefer the Intense. It seems sultrier and sexier, and simply makes more of a statement. Neither of the Prada fragrances smell strikingly unconventional or original, but then, neither do they smell (as so many of their designer fragrance compatriots do) blatantly commercial. The packaging is a perfect match: it is elegant but not showy, and has a "targeted to grown-ups" aesthetic that is a welcome change. Ditto on the advertising. Tomorrow: Prada Eau Tendre, with Prada Amber Pour Homme to follow over the weekend or early next week. I much prefer Prada Intense. I find it has this rye bread note, I think Victoria was the one who initially commented on it in her review. Nevertheless, I don't find either of them bottle worthy as they sort of just sit on my skin and get annoying too soon. However, Prada Pour Homme is another story – very well made. I think you hit on the head when you said that they are not super original but not extremeley “commerical” either. Of the two I prefer the regular Prada. The Intense one made me want to crawl out of my skin after the first 10 mins, I don't really know why. Yes, there is something sort of rye bread-ish about the Intense that certainly isn't in the original EdP. Neither of them annoy me, surprisingly since I don't like the main notes, but I also don't feel moved to buy them. There is just something about the whole line that I like. The advertising, especially, just strikes me as so much more dignified than most perfume advertising. I didn't like either, although I did appreciate what they were trying to do – as you say, R, they weren't just commercial, wishy-washy or teenybopper scents. The SA at my local Holt Renfrew told me they hadn't sold well here, but maybe they did better (inter)nationally. I found the advertising a wee bit creepy as well as more commercial, though. There seemed to be a trend out at just about that time where all the “elegant” women looked like corpses – there was a Vanity Fair spread of Cate Blanchett (sp?) at just abut that time where she looked similarly pale, sophisticated and dead. How interesting about the advertising — I didn't see it that way at all, but now that you mention it, she does look awfully washed out. Hmm. I wish I knew more about Prada as a fashion house; I've no idea what their “look” is. Still, most perfume advertising just verges on offensive to me, so this is a major improvement. She is fully dressed (in itself unusual! ), she isn't wearing ludicrous makeup, and she isn't posed in some idiotic way or surrounded by men who are pawing at her. I wanted to comment because I love, love, love amber perfumes but for some reason I just don`t like these. I don`t know why, maybe it`s just the way they are on my skin but from the moment I sprayed them on all I could smell was a kind of hot, melting plastic and it made me feel a bit sick. My favorite amber at the moment is actually the Laura Mercia “Ambre Passion” because it`s not too overpovering and I think with amber there is always the danger that your perfume is smacking people in the face before you even get to say “Hello”! or maybe it`s just the way I apply them!! On the melting plastic…I don't get anything like that at all. Hope someone else will comment if they smell it too! All too true! I don't think she would look better – & obviously she's beautiful – with flaming red lipstick in a lace teddy with men draped over her or in wind-swept black and white with sentence fragment narration. (That Gouda ad was dead-on!) Don't know what Prada's look is either, but she *does* look dignified to me – just also fairly anemic! I've had and smelled all of the Pradas and I like the original and their new one Prada Tendre (I know, you'll talk about that later..) Funny, this is the only amber scent that I like. I got turned off to amber because of a guy that I dated. He wore amber oil and he got on my nerves! So whenever I smell pure amber I just shudder….That's the thing about fragrances. Either a fragrance will remind you of a dear love one, or it'll remind you of someone you never want to see and date again! You know, I don't like either, just too strong and too much patch for my taste. But I look foward to your review of the men's fragrance, because I understand that it is divine. Quite so, it is so easy to build associations with fragrances that later ruin your enjoyment of them. But it can work both ways…I love Devin & Grey Flannel because they remind me of early loves. Yes, anemic is apt. There was a long and very interesting profile on Prada in the New Yorker awhile back and I wish I could remember more of it…wonder if this is their “look”. R, so surprised (but all the comments today are surprising me!) that you find the original strong. It is so soft to me! Okay, sticking my nose in here. I am not an amber fan. I HATED these — I find them overpowering and obnoxious, and the “regular” smells very masculine to me (whatever that means!) The Prada Tendre is just okay, but only because it's light and goes away fast! The Prada Pour Homme, then, I was prepared to dislike — and I adore it! I think it smells wonderful! But the reviews on MUA are apparently very harsh — summing them up, however, I think they have to do with how very feminine PH is. To me the original Prada is the PH… looking forward to your review. Surprised yet again…I would have called the Intense more masculine than the regular (although either would qualify as unisex to me) and neither overpowering. I obviously am missing whatever everyone else is smelling! I agree with you. It is too strong for daily wear but might be OK for a blacktie party. I tried a little bit in the local store and made the biggest mistake in my life to buy the largest bottle of Prada intense when I was suposed to buy chanel No.5. I doubt how often I will wear it since it started giving me the dizzy feelings in my head. I love amber perfumes too, but this one doesnt leave a lasting, edgy impression. It is a safe, sophisticated perfume for me. Havent tried Intense. Still, its not that bad. No, it isn't an edgy scent at all. Prada parfum is long lasting and a very complimentary scent. It’s a great fragrance, yes! I am trying out Prada and Prada Intense. At first sniff of just the Prada, my first impression was “hmm, is this men’s cologne?” I have grown accustomed to and very much like your typical very obviously “feminine” scents. However, this really grew on me, so much so that I ordered a 2nd sample and samples of Prada Intense and the Infusion d’Iris also. It has really changed my perception on what I think I like and don’t like! I have to say that although they are similar, the Prada Intense is definitely a “different” perfume than the Prada. I like them both very much. The Iris is “difficult” on me – it’s been giving me a “metallic” note that doesn’t appeal to me at all. Thanks for a great review on these – it inspired me to spread my wings or hmm, nostrils – lol! Did you try the L’Eau Ambree? I love that one too, maybe more than either of the original Prada Ambers. Hi Robin! Yes, I did also try L’Eau Ambree and I liked it but I didn’t love it. It’s a little too wispy for me. It didn’t have the same lasting power that the other Prada’s had so it just wasn’t a good fit for me. Been wearing Prada all weekend so far…and it’s got me hooked as a great weekend fragrance. Goes well with jeans and goes well with a skirt out dinner too! Good, then you’ve already ruled that out. I succumbed to a full bottle of the Prada Intense when I got my tax refund and it really is addictive! And yeah I love the atomizer! It’s just so very glamorous! One spray and the amount released is perfect. Infusion d’Iris stole my heart, and I ended up buying the purse atomizer of Prada edp because it came with a bottle of d’Iris (yay, eBay!). Usually I can’t tolerate even a teensy bit of patchouli, and amber isn’t a fav. This purchase was a major leap. Lately I’ve been really liking skin scents, and I’m glad to add this one to my arsenal. I am really liking skin scents too, and there are so many new ones, which is nice. I dig Prada as a no-thought-required “wallpaper” scent that’s easy to wear but not boring. I do find it similar to Coco Mademoiselle, but even moreso to Narciso Rodriguez – that smooth, skin-musky effect after the inital blast wears off. And I’m actually rather shocked at how unisex it smells, given the Prada label, pink box, and elegant, sophisticated aura of the advertising. There’s almost no overt sweetness, no screaming florals, no powder (which I often get with amber scents), and no aldehydes. It’s actually earthier and richer (if not necessarily darker) than the men’s version, which is too lavender-iris-soapy for my taste. I like the men’s version better, but you’re right that a man could wear the women’s (and I think a woman can easily wear the men’s).